Skyrim is the northern province of Tamriel, a land of breathtaking beauty and lethal winters. It is one of the ancient seats of power in the Empire and well-populated by the Nords. As if to compensate for their freezing environment, the Nords are famously hot-blooded and the political climate can be as shifting and dangerous as the winds. Looking at virtually any vista in Skyrim, one is looking at the remains of a battlefield. The great Aedric cataclysms that brought Tamriel into existence in primeval times seems to have spent most of their fury in this northern land. Vast majestic mountain ranges form the spiny twisted backbone of the province and one can hear echoes of the early Nedic people's battle cries whistling in the winds of the valleys. Tradition has it that the first humans came to Tamriel from the continent of Atmora in ancient days. It was a not a single invasion but a series of them over hundreds of years, creating many different Nedic cultures, the new-arrived Atmorans always clashing with the generations that had already established themselves. The region around Saarthal in the high northern coastal mountains exchanged hands many time [sic], becoming more powerful and more permanent, like the Nords themselves, by adversity. 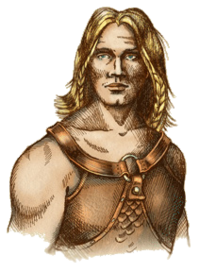 In addition to fighting one another, the Nedic people faced off against a new enemy, the Aldmer. The struggles between the two - prototypical men and prototypical elves - continues in some form or another to this very day, as the Nedic people became the Nords, Imperials, and Bretons, and the Aldmer became the Ayleid, Altmer, Dwemer, Chimer, Dunmer, and Bosmer. Out of this time also rose one of the most legendary of all Tamrielic figures, Ysgramor, from whom all Nordic kings are descended. Spreading out from the north, Ysgramor's clan stretched its arms, proving that no ancient force was more fearsome than the Nords. In the 113th year of the First Era, the entirety of modern Skyrim was under the reign of King Harald, and still, it continued to expand. Leaving their snowy valleys and mountains, the Nords attacked the Dwemer of neighboring Resdayn, the Altmer and Bretons of High Rock and lent aid to the rising slave rebellion in Cyrodiil, which was to end the Ayleid rule of the south. In the centuries that followed, Skyrim expanded and contracted as battles were won and lost. Though Cyrodiil was considered a separate domain, the Nords and the early Imperials formed a loose alliance against their elven opponents, their cultures mixing together, creating the foundations of modern day Aedric worship. Yet Skyrim remained the dominant human nation in Tamriel until it was torn apart by rivalries within the Ysgramor clan. As individual chieftains fought each other, Skyrim gradually lost her holdings in present day Morrowind and High Rock, and certain localities in Skyrim became independent kingdoms. For brief periods, one ruler has managed to unite all of Skyrim, but the Nord character is one essentially of conflict, and the confederacies never last. The Cyrodilic Empire and later the Septim Empire was able to take advantage of this tendency and recruit the warlike Nords to their side before they became a force of the opposition. 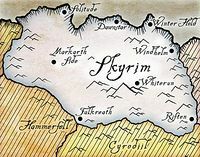 In the third era, if Cyrodiil has been the heart of the Empire, Skyrim has been its strong arm. The greatest threat to the Empire's unity occurred in the 120th year, when the so-called Wolf Queen of Solitude, Potema, aunt of the Empress Kintyra, launched a rebellion that became a bloody civil war. Though it was eventually quelled, the repercussions are evident to this day. There is a strong underground movement called the Hörme that believes Potema and her deposed son Uriel III to be the last of Tiber Septim's true blood and under that principle lead raids against Imperial interests in the province. Under the Imperial Simulacrum of Jagar Tharn, cold animosities between the kingdoms of Skyrim and their neighbors in High Rock and Hammerfell were fanned into the fire of war. Upon our true Emperor's return to his throne, this war ended, but not before Skyrim had reasserted itself on territory it had not held since the 1st Era. The War of Bend'r-Mahk increased the territory that is considered Skyrim considerably, allowing the Nordic counts to swallow up many miles of eastern High Rock and Hammerfell. Resistance by the Bretons and the Redguards is feeble in the cities of Jehenna and Elinhir, and more active in the border zones of the countryside. The city-state of Dragonstar continues to be divided into western and eastern sections, walled off from one another, each with its own government, and each with an atmosphere of mistrust and fear. There are few days without an act of terror from one resistance group or another, though so far little territory has changed hands since the days of the Imperial Simulacrum. Solitude, always one of the richest and most influential counties in Skyrim, has grown ever more powerful, controlling much of the northern coastline following King Thian's alliance by marriage with Macalla, the Queen of Dawnstar. It has sought to expand its influence further by annexing several former Imperial fiefs, such as the island of Roscrea, ruled directly by the Emperor since Uriel V conquered it in the 271st year. It has begun sponsoring exploratory missions even farther from the mainland into the misty waters of the Sea of Ghosts. Winterhold, Solitude's ancient rival, has also experienced a renaissance of power and influence. Refugees from Morrowind, far from burdening the eastern city, have brought with them new ideas, enriching her culture and stimulating its old mercantile spirit. Scholars from all over Tamriel have descended on the county since it became home to the Ysmir Collective, a library rescued from destruction in the east, and the cornerstone of academic life at the College of Winterhold. Hrothgar and Whiterun have not been as fortunate as their coastal northern cousins. A dynastic feud, attacks by Hörme bandits and frost trolls, and a series of annihilating winters of alternating floods, droughts, and fires has crippled the area that was once considered the Imperial City of Skyrim. The population blamed and then curiously exalted the leader of the local witches' coven, Jsashe, a self-proclaimed priestess of Lorkhan. The Witch-Queen of Whiterun, as she is called, now wields effective control of the county, though her magic has not brought prosperity as of yet.